Hike the Grand Canyon of Europe! If you love dramatic landscapes and the power of nature, then this is one for you. Experience the stunning limestone gorge carved by the Verdon river, one of the most beautiful in Europe and a magnet for walkers, climbers, bird watchers, geologists and canoeists from around the world. 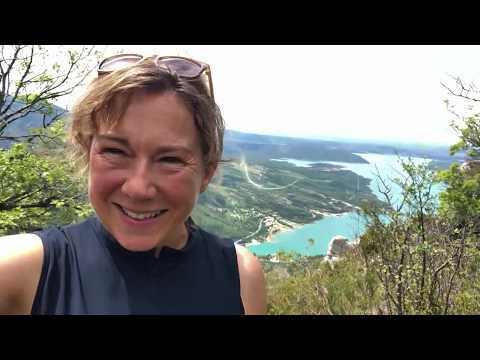 We walk from the foothills of Haute Provence through the Verdon National Park, and some of the most dramatic scenery in France as we make our way along the GR4. The 25km (15.6 miles) of the Verdon Gorge makes it the largest canyon in Europe and second in the world slicing through the limestone plateau midway between Avignon and Nice. Carved by the turquoise water of the Verdon River, the gorge is between 250m (829ft) to 700m (2296ft) deep. The bottom is 8m (26ft) to 90m (295ft) wide, while the rims are 200m (656ft) to 1500m 4920ft) apart! The National Regional Park of Verdon was created in 1997 to protect an environment that has evolved over two million years and also prides itself in being labelled by UNESCO as the largest geological reserve in Europe. It’s hard to pick a winner when it comes to the accommodation. Lindsay our guide was absolutely excellent, knowledgeable, helpful and friendly and a pleasure to spend seven days with. Memorable moment? That’s a tough one, maybe picnic lunch overlooking Lac Sainte-Croix. This evening you will meet your guide in the small village of Saint-André-les-Alpes. Saint André sits at the head of the turquoise Lac de Castillon. This quiet, Provençal village was built on the site of a 12th century medieval castle built by the Templar Knights and can be easily linked by road with other Provencal regions on what's known as the Route La Lavande. Early arrivals may be interested in taking the local 'Train des Pignes' opened in 1911 from Saint André to visit the spa town of Dignes-les-Bains. The city has five museums, two cathedrals, a geological park, and thermal waters. It is a town rich in producers, craftspeople and artists. From our hotel in Saint-André-les-Alpes we take the famous long distance walking route the GR4 which follows the old route used by the Romans to reach Lyon. We ascend steadily through mixed woodland to reach high meadows and a ridge on the western side of the lake which offers excellent views of the Lac de Castillon, the neighbouring valley and back towards the peaks of Haute Provence. The trail meanders over a high a limestone plateau where in springtime the primroses can be found in abundance. On the way we pass the pine trees where local people can be found collecting the sap to make 'pine sweets'. After passing old farm buildings used by the French Resistance fighters in World War 2, we then descend and join the famous Voie Imperiale, a trail used by Napoleon returning from Elba, in March 1815. Our destination today is the village of Castellane a beautiful example of the architecture of the area. If time allows a walk up to the 'Notre Dame de Roc' is well worth it as from here we gain commanding views of Castellane and the Verdon River. We leave Castellane and continue along the GR4 trail which meets the Verdon River and a delightful Roman Bridge. We then climb gradually on easy wide trails to gain our first views of the Verdon valley. With the river running beneath us towering cliffs, and jagged rocky spires line our path. We pass sleepy hamlets and houses typical of the region, with red tiles and terracotta walls. We plan to stop for lunch at the lovely old school, now a gite, at Chasteuil which is run by Pascal. The family hand make lovely cosmetics and lotions made from natural ingredients and there is always the temptation to buy a few samples! We then make a second steady climb, again on good tralis, to reach a high wide open plateau where we are rewarded by our first views of the Verdon Gorges itself. As our trail descends further we arrive at the medieval village and castle of Rougon. Perched on a rocky outcrop Rougon has a small chapel at it's centre, connected by narrow cobbled streets and is home to various artists and the best creperie we know (and that is saying a lot!). From here we enjoy great views of the 'Grand Canyon' of the Verdon and if we are lucky we will see the magnificent griffon and black vultures. The association of "Vultures in Haute Provence" reintroduced these stunning birds in the 1990's and watching them in flight with their 2.5m (8ft) wing span is an absolute highlight of this trip. A further 30 minutes brings us down to the head of the gorge to the perfectly situated Auberge du Point Sublime, our hotel for the night. If we are unable to stay at the auberge our alternative accommodation will be at the creperie 'gite' in Rougon village called Le Mur d'Abeilles. Today we enter the famous 'French Grand Canyon'. From our auberge, we have a short walk to the trail which leads us down to the Couloir Samson and the Verdon river 300m (984ft) below. Here, the trail is more challenging under foot as we descend toward the river along the steep walls of the gorge joining what is known as the 'Martel Trail'. What follows is a stunning world of limestone, towering cliffs and jade green waters. This trail was laid out in 1928 by the Touring Club of France and takes the name of the French speleologist, Édouard-Alfred Martel (1859-1938), who undertook the first complete descent into the canyon in August 1905. After a day of exploring we have a steep climb out of the Gorge, but the good news is that we exit the gorge at a bar, which seems to go down rather well! Tonight we stay in the lovely Provencal village of La Palud. The trail today leads up and through a large pine forest to the Col de Plein Voir which has the name suggests is an exceptional viewpoint above the turquoise lake of Saint Croix. It is very pleasant walking today as we make our way on a single track trail through larch and pine forests along the Crete de l'Ourbes, a limestone craggy top, to reach 1213m (3978ft). The trail offers views to both sides, and is one of our favourite days. A final, steeper and rocky descent brings us to the valley floor and the picturesque village of Moustiers-Sainte-Marie, where we spend the night. Moustiers, steeped in the history of the Knights Templar, is a gem of a village. It is totally Provençal in its nature with many lovely art workshops and galleries to visit. Definitely plenty of retail therapy today, if you want it! Still on the long distance walking route of the GR4 route, we leave Moustiers behind as we head down the valley and across low lying meadows which are often dotted with red poppies. We then begin to climb through the pines to a higher plateau which provides excellent farming land. Be prepared for the scent of aromatic plants such as lavender and field after field of crops. At one point there are well manicured lavender fields stretching in every direction with a backdrop of the higher Alps. Our trail continues past a truffle farm, then through orchards of apples and oak trees. A coffee stop at the old village of Roumoules sets us up for the last climb of the day to regain the higher ground, before descending to the ancient Roman riverside town of Riez - also known as the 'Lavender Capital' - another souvenir destination. The town is full of character and there are many shops, a pharmacy, cafes, and bars. Our last and longest day completes our traverse of the Verdon Nature Park, and has a touch of Provence around every corner. The route begins along a quiet lane, then follows ancient mule tracks and paths. These link rolling fields of wheat, lavender, poppies and coriander to reach the village of Saint-Martin-les-Bromes and its thirteenth-century tower built by the powerful Knights Templar. There is a quaint cafe here where we often enjoy putting our feet in the cool waters of the fountain while sipping a cold drink. Back on trail the final section of our GR4 walking route leads us partly through forest, then to fine views of our final destination, Gréoux-les-Bains, stretching out below us. Gréoux is a hilltop Roman town and popular hot mineral spa destination complete with characterful narrow streets and a "Templar" chateau overlooking the town. We aim to arrive with time to explore or simply relax before enjoying our final meal and overnight. Today is departure day. Details about how to get to and from this trip are given in the Trip Information section, under "Arrival & Departure". Accommodation will be in small villages along the route. All accommodation is en suite and is in clean and characterful Provençal auberges and hotels. It is based on two people sharing a room. A single supplement may be available upon early booking. This stately old building sits on the edge of town and looks out down the valley. The name Lac et Foret, 'Lake and Forest' says it all really in terms of the views. The hotel has twenty comfortable rooms with en suite facilities and we always receive a warm welcome here. The Auberge Bon Accueil is situated in the heart of historic Castellane, with a restaurant serving classic Provençale dishes and a range of comfortable en suite rooms available. This is a true rustic Provençale auberge that simply oozes 'character'. It certainly feels like the genuine French experience to be sitting on the terrace watching the world go by. We love staying at Pointe Sublime, as the name suggests the Auberge is located at a magnificent viewpoint over the Verdon Gorge. For three generations the same family has welcomed travellers and hikers. They described the Auberge as a typical Provencal family hotel, with comfortable en suite bedrooms, and a shady terrace to enjoy a drink. If we are unable to stay at the auberge our alternative accommodation will be at the creperie 'gite' in Rougon village called Le Mur d'Abeilles where the evening can be spent watching the majestic vultures swooping overhead. The restaurant has the accolade Pays Gourmand and also the label "Maître Restaurateur". This means excellent home made food based on local produce chosen from local producers known to the family. They love to say they offer authentic cuisine with the scents of Provence. This is a characterful family run hotel in the tiny village of La Palud. The hotel is in the centre and with easy access to the small range of artisan gift shops and bars. The bedrooms have en suite facilities and many have balconies. There is a terrace by the hotel where you can enjoy a drink in the sun, or the shade! La Bonne Auberge is ideally situated at the entrance to one of France's most beautiful villages, Moustiers-Sainte-Marie. It has comfortable rooms with ensuite facilities, a shaded terrace where you can enjoy the local offerings from the restaurant, and a great outdoor pool. The hotel is ideally place for exploring the centre of the village as it is only a few minute walk to all the shops, cafes, and bars. Our 3*** hotel in Reiz is quite different to the others on the trip. It is a modern hotel set on a leafy, hillside property offering contemporary bedrooms with balconies, and sitting areas. Relax on the very lovely garden terrace, or the lounge area in the lobby. The decor features extensive marble, and stone and it feels lovely and cool after the heat of the day. A former coach house, this lovely hotel is close to the Gréoux-les-Bains thermal spas and offers very comfortable bedrooms, a heated outdoor pool, and has an excellent restaurant with a terrace. The hotel has a rose garden, and outdoor seating so that you can enjoy relaxing at the end of your hike. The hotel also has a spa and can arrange massages to ease any tired muscles! Dinner is really excellent with food prepared from local produce. There is a spectacular train ride through gorgeous Provencal countryside, from Nice, France, to the start of your trip at St Andre Les Alpes. It is on one of the very few private railways in France, and with trains running four times a day it is an easy way to get to the start. It is also excellent value for money being approximately 20 Euros per person for a single journey of about 2h50. Saint André Les Alpes is approx 2h00 by car from Nice. We can provide contact details for a private transfer which you may wish to share with other members of the trip. Many guests prefer to arrive a day early and explore the ancient seaside boulevards of Nice and the old town. The timetable for the wonderful train service from Nice to Saint André Les Alpes on the historic Train des Pignes can be found here. A MUST for train fans! At the end of the walk in Greoux-les-Bains there are several methods for onward travel. First you must travel to either Manosque (20 minutes away) or Aix en Provence (45 minutes away) where connections are possible across France including to the nearby Luberon region. The bus stop in Greoux is about 100m from the hotel and all buses arrive and leave Aix from the main bus station. Marseilles and Marseille Airport by bus goes via Manosque and takes 1 hour 40 minutes. Follow this link for bus times to Marseille Airport. Flix Bus runs a service from Aix en Provence to Nice and Nice Airport taking 2 hours 30 hours, depending on the timings. Tickets can be bought in advance for the intercity buses but not the regional buses. We recommend buying regional bus tickets on the bus itself to avoid queues. Other onwards travel details from Greoux can be found here on the local website. Please contact us if more detailed travel information is required or help is required with translation. In mountainous terrain the weather can vary considerably and you should always be prepared for any eventuality. Temperatures in Haute Provence, France, range from daily highs of 17°-21°C (63°-71°F) in April, and May, to daily lows of 5-9°C (41°-48°F) . In September and August the daily temperature ranges from an average 24-29°C (76°-84°F), down to 11-15°C (53°-59°F). It is often sunny with good clear days and can be very warm where hydration will become important, but it can rain and the temperatures can drop dramatically. It is not unusual for thunder storms to occur at the end of the afternoon and waterproof clothing should be carried at all times. When booking a holiday as a solo traveller a twin bedded room comprising of two single beds, is booked as standard. This will be with someone of the same gender unless you request to pay extra for your own room. Single rooms are often limited in supply so if you would like to pay a supplement for a single room we urge you to get in touch as soon as possible. This trip has a single supplement of £315. Suitable for those of you who consider yourself ‘hill-walkers’, these trips involve longer days at an altitude of up to 2800m (9184ft) on good paths and tracks. A good level of fitness is required as these treks can involve considerable amounts of ascent and descent and the occasional difficult day on rougher paths. There may be an occasional day with ascents/descents of up to 1350m (4428ft). We would expect you to have previous experience of walking on consecutive days in the mountains, and have experience of hiking in bad weather. Expect to walk 5-7 hours per day. NB: We have graded this trip 'Difficult' because the days are lengthy, but we would say this is at the lower end of the scale and nearer 'Moderate' in terms of terrain and fitness required. We would not consider it essential that you had previous mountain walking experience if your mental attitude and level of fitness is good!